My thanks to H. Roy Jaffe for writing the following data for 3-wheelers.com and providing the images on this page. What better way to learn about history could you ask when it comes directly from the pen of a gentleman involved. DEFINITION: Tri-Car was a singular three-wheeled car built and announced to the public in 1955. It made its debut at the Universal Travel & Auto Sports Show at Madison Square Garden, New York City, held February 20-27, 1955. 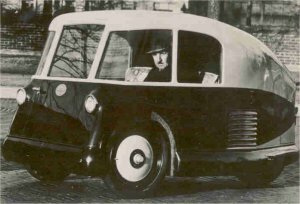 The history and background of this innovative vehicle are fascinating, both from the technical standpoint and its creator, Captain James Vernon Martin. This article was compiled from numerous documents in my files as well as personal experiences with the car, its development, and the various people associated with the project, including James V. Martin. James V. Martin (1883-1956) was a pioneer aviator, engineer, and inventor. He conceived and built numerous vehicles, both 3 and 4 wheeled. They were basically concept and prototypes, built hopefully for production. The earliest documentation I’ve seen is Patent No. 1,989,995 issued to J. V. Martin on Feb. 8, 1935 from a filing on Feb. 26, 1930; and it was entitled AUTOETTE. It featured 2 front steering wheels and a single rear wheel, a rear mounted engine, and a revolutionary front door entrance. It included sketches showing the side profile and top view, with and without interior components, and a front view without the door. Layout is similar to the Italian post-war Isetta of 1953-1955. Martin transferred his ventures in 1922 to Garden City, Long Island, New York. He designed and built a 3-wheeled prototype around his patent in 1932. It was called Martinette. It had the same features as the patent: 2 front steering wheels, a single driving rear wheel and engine, and a front door entrance. The body was aluminum built onto a wood frame. The car virtually disappeared until 1987 when an ad appeared in Newsday classified of Oct. 4, 1987, offering the car for $2,500. A curator at the Cradle of Aviation Museum on Long Island and I both saw this ad. I knew the history of this car. We met at the home of the seller who stated he originally found this disheveled vehicle in a chicken coup in the Hamptons, Long Island, NY. I knew Henry Austin Clark, Jr., a prominent auto historian and owner of the Long Island Automotive Museum. At our request, Mr. Clark wrote a lengthy appraisal; and indicated that this particular car appeared in the 1932 New York Automobile Show. The end result was the seller received a tax write off by donating the car to the Cradle of Aviation Museum. Subsequently, the Museum totally restored it and placed it on display. Currently, it is on loan to Owls Head Transportation Museum in Maine. Since I was previously involved with the Tri-Car, I had the original blueprints for this car and I donated them to the Cradle of Aviation Museum. Stationette - Awarded the Grand Prix - World Motor Sports Show - 1954. Martinette - Showing roominess and comfort; Occupant 6’3” tall. A curator at the Cradle of Aviation Museum on Long Island and I both saw this ad. I knew the history of this car. We met at the home of the seller who stated he originally found this dishevelled vehicle in a chicken coup in the Hamptons, Long Island, NY. I knew Henry Austin Clark, Jr., a prominent auto historian and owner of the Long Island Automotive Museum. At our request, Mr. Clark wrote a lengthy appraisal; and indicated that this particular car appeared in the 1932 New York Automobile Show. The end result was the seller received a tax write off by donating the car to the Cradle of Aviation Museum. Subsequently, the Museum totally restored it and placed it on display. Currently, it is on loan to Owls Head Transportation Museum in Maine. Since I was previously involved with the Tri-Car, I had the original blueprints for this car and I donated them to the Cradle of Aviation Museum. This brings us to the 1955 Tri-Car. I was a senior style designer at General Motors in Detroit. I returned to New York City in the early 1950s as a free-lance industrial designer. I have no recollection how I met Horace Keane who got me involved with the Tri-Car project. He was a close friend and associate of James V. Martin. Martin and Keane were members of the Early Birds – those who flew planes prior to Dec. 17, 1916. Horace Keane’s office was Commonwealth Research Corporation, 11 West 42nd Street, New York. He basically coordinated the project with me and many other individuals. The corporate letterhead was “Martin Stationette Associates”, beneath which was typed “TRI CAR CORPORATION of AMERICA” and the address “11 West 42nd Street, New York, N.Y.”. For a brief period, I was living in Plainfield, N.J. Probably, after a series of sketches, I finalized the design with two views: ¾ front and ¾ rear. These two approved sketches subsequently appeared on a corporate 8” x 10” glossy publicity sheet which also included photographs of the Stationette and the original Martinette. I next drew a full size drafting of the side view on vellum on the wall of my room. I have a blueprint of this drawing that is dated Nov. 27, 1954. My earliest correspondence with Horace Keane was his letter of Oct. 25, 1954 wherein he sent me a base layout showing 55” width. I made other drawings as well, including full size template drawings of the body sections. He also notes that (Stu) Greenfield will be in town over the weekend. Stu Greenfield was the principle of Clearfield Plastics where the mockup and fiberglass body was made. Keane wrote a letter to me on Nov. 15 that he would be visiting the Clearfield airport Fixed base Operators that have the mechanics, space, and equipment to assembly the vehicle. They, Clearfield Plastics, or others did the final assembly of the Tri-Car. I wrote a comprehensive report to Horace keane on Dec. 6, 1954 outlining my conversation with Clearfield Plastics, with copies sent to P.C.Belknap, C.H. Payne, A.W. Procter, and Clearfield Plastics. 12 subjects discussed including production of the first body as designed, rough sketches of the instrument panel and interior door panels given to Clearfield, single flat glass for the windshield complemented by curved sections on either side, and rear light adapted from a 1953 Chevrolet mounted horizontally. A Dec. 9th letter to me from Paul G. Belknap indicates that I would design the Tri-Car emblem, which was subsequently used on the sales brochures and other literature. A Dec. 14th letter to me from Charles H. Payne indicates that a joint meeting would be held the 3rd weekend of December in Clearfield, Pa. With Payne, Blenkle, Greenfield, and myself for final approval of the body. Only a single working Tri-Car Surburbanette was built and shown at the Universal Travel & Auto Sports Show at Madison Square Garden, New York City, held February 20-27, 1955. There were discussions of two others: one with a transparent panel above the seating area and a second with a removable fabric. There was no time for either one, considering that from concept design to a working car was under 4 months. The 8 ½” x 15” Tri-Car sales brochure foldout primarily features the Suburbanette. An inside page notes 2 others: “Kari-van” with photo of a burnished aluminum with airplane riveted construction – a light panel truck. 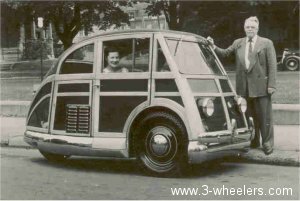 It is a 3-wheeled vehicle very similar to the 1932 Martinette except it is higher in the rear and has side doors. The second is a description only of a “Stationette”, same name as the wood one shown in 1954. Description stated it had the same front styling as the Suburbanette, but with an enlarged rear body for light parcel delivery. This was never built. Jerry D. Falck, an auto historian who researched in 1988, believes Payne sold interest in Tri-Car to Fairchild Aircraft, and they in turn, were sold to Rohr Industries. Nothing further is known about the Tri-Car Surburbanette. There was another 3-wheeled vehicle developed by Bassons Industries in The Bronx, New York with a joint connection with the Tri-Car group. 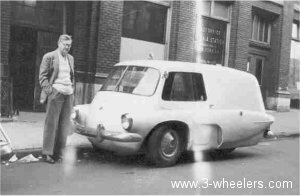 It was a 3-wheeled vehicle light panel delivery made in fiberglass around the same configuration. I have 3 photos of this vehicle on the street. In the Dec. 9th letter from Belknap noted above, the group did not want to use the Basson design further for any purpose as they would be legally responsible for other payments. I do not know the fate of this vehicle. I have complete documentation, correspondence, sales brochure, sales card, postcard, banner, Christmas card (which I designed), press releases, news articles from the Wall Street Journal, The New York Times, Newsweek, and Automotive Industries. Horace Keane and I visited with Capt. Martin at his New Jersey home during this period. Charles H. Payne, President, 1010 Vermont Avenue, N.W., Washington 5, D.C. and 551 Fifth Avenue, New York City, N.Y.
Paul G. Belknap, 1010 Vermont Avenue, N.W., Washington 5, D.C.
Horace Keane, Management Committee, 11 West 42 St. New York, N.Y. Factory listed as Council Avenue, Wheatland, PA.
Bassons fiberglass delivery, and 8 x 10 glossy sheet.